View of the site of the proposed Powerhouse Museum Precinct in Parramatta. 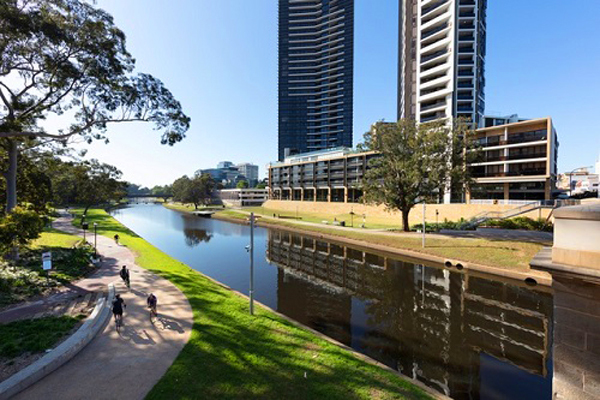 An international design competition has been launched for the design of the new Powerhouse Precinct in Parramatta, Sydney. To be built on the banks of the Parramatta River in Sydney’s newly designated Central River City, the precinct’s centrepiece will be a 24-hour museum featuring 18,000 square metres of purpose-built exhibition and public spaces, a highly advanced planetarium with ultra-high-resolution 3D video and multi-channel immersive audio, and Australia’s first dedicated learning space devoted to STEAM (science, technology, engineering, arts and mathematics). Australia’s New South Wales minister for the Arts, Don Harwin formally launched the open global search for an outstanding world-class team to design the landmark precinct. The two-stage competition invites submissions from Australian as well as international design teams and also actively encourages creative and intellectual collaborations between established and emerging talent. Founded in the late 19th century as the Museum of Applied Arts & Sciences (MAAS), the Powerhouse Museum is currently located in Ultimo. The massive exhibition and public spaces planned for the new precinct will enable the museum to embrace a new curatorial strategy of integrated and immersive programs. The deadline for Expressions of Interest is 22:00 AEDT/ 11:00 GMT Monday 18 March 2019. At least five finalist teams will be selected at stage two and each finalist team will receive an honorarium of AUD $150,000. The designs produced by the shortlisted teams during stage two will be shown to the public in a physical exhibition and online gallery for feedback. Minister for the Arts, Don Harwin says, “I am delighted to open this competition as we fulfil our promise to the people of Western Sydney to deliver a major cultural institution they can be proud of. Jury chair, Naomi Milgrom says, “The new Powerhouse Precinct at Parramatta is one of the most exciting cultural projects in Australia. Competition director, Malcolm Reading says, “This competition has been eagerly awaited by the international and Australian design community. “The competition process has been endorsed by the Australian Institute of Architects and the jury will be chaired by Australian entrepreneur Naomi Milgrom, an outstanding asset for the competition.